At GetOutdoors, we know how important it is for you to concentrate, collaborate and connect at work. That’s why we’re here, to make it easier for you to get out of the building. WHY SHOULD YOUR TEAM GET OUTDOORS? Mental health costs Australian businesses $10.9b each year. Walking in nature reduces depression, anxiety and stress. It improves mood, memory and sleep. Walking for 30 minutes each day increases productivity by 25%. Walking in nature increases creativity by 60%. To think outside the box, get outside the box. To read more about why this is important as an employer, click here. To read about why this is important for you, click here. Getting your team out of the building for walking meetings is our first priority. It’s the foundation for a more active lifestyle, at work and beyond. So we remove the biggest barrier to walking meetings - knowing where to go. We want your walking meeting to be as effective as possible. We know that’s often not the case as you can get lost or distracted and have to spend valuable time working out where to go, rather than focussing on the important matters at hand. 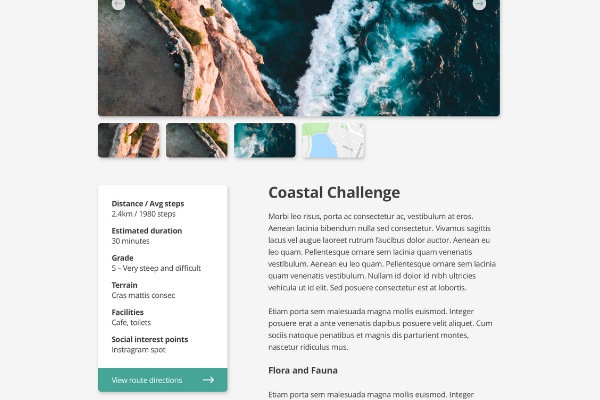 At GetOutdoors, we build curated routes starting from your office and host them on a branded webpage which can be linked to any employees resource portals. We can also work with you to physically display the routes around the office to nudge and motivate your team to get out of the office. Bespoke curated routes hosted on your own branded webpage. Click through your desired route for more details and a link to Google maps so you can follow directions. Together, let’s build an inclusive community around an active workforce. Thank you for registering your interest in Get Outdoors! We’re almost ready to launch so keep an eye out for our emails to find out when you can start using GoBot with your organisation. I really didn’t think or want to go for a walk but when I started and our ideas started flowing and we started creating more ideas. We’ve all been sitting in front of screens all day so it was great to get out in nature. This is the perfect time. We needed this walk. I was hitting a wall. Normally I would have reached for coffee – this was better! GetOutdoors is a national organisation dedicated to inspiring, motivating and supporting Australians to feel confident in the outdoors. We’re passionate about the outdoors and committed to making it more accessible and approachable for all Australians and our international visitors. While many Australian’s enjoy the incredible natural landscape we’re blessed with, 81% of us don’t enjoy it as much as we should. So we set out on a mission to build health and wellbeing in to your work day so that old excuse of ‘I’m too busy’ is void. As we help you feel more confident in your work week, we hope that confidence will overflow to your weekends and extend to your family and friends, creating a national shift to a healthier society. Kicking off Steptember with a walk to work with Deputy Lord Mayor Jess Miller.